How old are Taijiquan and Taiji philosophy? Recent findings indicate that the basic Taiji movements and Internal Arts theory of breathing and Qi circulation pre-date Zhang and Chen significantly. Qianzai Temple was a synthesized Temple of Buddhism, Daoism, and Confucianism. The three studied martial arts and philosophy together, and became sworn brothers, taking the abbot Bogong Wudao 博公武道 as their master at the Taiji Gate 太極門 of Qianzai Temple. Supposedly Chen was allowed to name the art after the three sparred and their master deemed him the winner. Sharp corners impede movement. Rounded shapes roll and flow. The concept of the Dao, the natural way, is here expounded upon 200 years before Buddha, and 600 years before Jesus. How old IS Taiji philosophy? 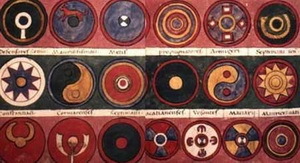 The creation of the first Taiji yin/yang symbol is sometimes attributed to Zhao Huiqian (1351-1395 AD), entitled Tiandi Zhiran Hetu (Heaven and Earth’s Natural Diagram of the River). But the yin/yang is known to be far older. In 1993, the Guodian texts were discovered in a tomb in Hubei province. These are the oldest known version of the Dao De Jing, dated to the 4th or 3rd century BC, which contain much more text than the previously accepted Dao De Jing. 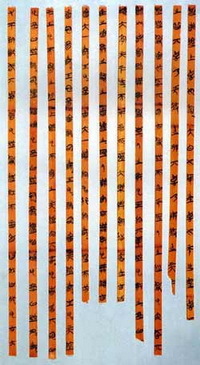 Of the 12,072 characters written on bamboo tablets, 2,000 correspond to the present-day Dao De Jing. In fact, the name Laozi (Lao Tzu) simply means 'old master'; this collection of text was written by an unknown author, or several, in the 4th or 5th century BC or earlier (interestingly close to the time of Buddha, Siddhartha Gautama's attainment of enlightenment in Nepal/Ancient India). The concepts of Taiji, yin/yang, and wuji 無極 existed long before the time of Zhang, San-Feng. It is widely recognized that Zhang's history has been elevated to legend as a way to assert Chinese national pride at a time when Buddhism from India/Nepal had become so widespread in Asia. Buddhism slowly entered China via the Silk Road starting in the first century, and the teaching of Bodhidharma (Da Mo) around 500 AD, the 28th patriarch of Buddhism, impacted China so deeply that at one point there were as many as 10,000 Buddhist temples across China. Daoism and Taijiquan were considered "indigenous Chinese", and were therefore sometimes exonerated over the imported Indian Buddhism for political reasons. "...two hundred and sixty thousand five hundred monks and nuns are returning to the world, both to be received as tax paying householders. Refuges and hermitages which are destroyed number more than forty thousand..."
Simultaneously, he promoted Daoism widely, and during this period all public display of religious and martial art practice were exclusively Daoist. Buddhist practices went into hiding, or were absorbed into Daoism. Taijiquan is closely associated with Wudang mountain, the place of Zhang's enlightenment, because the practice of the Internal Arts as an essential aspect of Daoist study has a history at Wudang of at least 2,000 years. Large in scale and awesome in technical detail, Wudang Mountain and its Temples are the perfect metaphor for Taijiquan itself. The Wudang Mountain range in Northwest Hubei Province, which spans over 321 square kilometers, consists of 72 peaks with 72 rock temples, two dozen other architectural masterpieces, many lakes, rivers, and a beautiful forest which to this day sustains over 600 known Chinese herbs. Like Taijiquan, the Wudang complex is a monument to the great spiritual achievements of ancient Chinese culture. In ancient times, the mountain was known as Taihe Shan. In the years between the 8th and 4th centuries BC, (the Spring and Autumn Period 春秋時代), the Chu Kingdom used the Wudang Mountains to fend off the invading Qin army. The name Wudang originates from an ancient quote that describes the defensive role that the mountain served; “fei zhen wu bu zu dang zhi” means “only true martial arts can provide resistance.” Wu means “martial” and Dang means “resistance”. Even in ancient times, the martial arts of Wudang were revered. Was Xu, Xuan-Ping's 37 developed in 800 AD based on the 13 Postures from Qianzai 100 years earlier? It is more probable that these basic self-defense movements were practiced widely, or perhaps primarily in Hubei province, and credit for marrying them with Taiji theory can not be ascribed to one single person. "Taiji Chang Quan" existed in many variations, and eventually evolved into Taijiquan. Other forms of the same era such as "Heavenly-Inborn Style", "Nine Small Heavens", and "Acquired Kung Fu" also show similarities to what later became Taijiquan. The principles of softness, sticking, adhering, and using the opponent's own momentum against himself were established in these precursory martial styles. Bodhidharma's teaching at the Buddhist Shaolin Temple, which detailed the theory of using the mind to lead the Qi to energize the physical body, is widely considered the origin of the Internal Martial Arts. One must also consider not only the specific martial art movements of Taijiquan, but also the principles of Qigong (energy cultivation), that are also an essential aspect of Taijiquan and all Internal Martial Arts. Hua-tu'o's Five Animals Qigong around 250 AD may also be considered an influential precursor to the slow, natural movements of the Taijiquan form, and earlier shamanistic animal exercises are known to have existed. 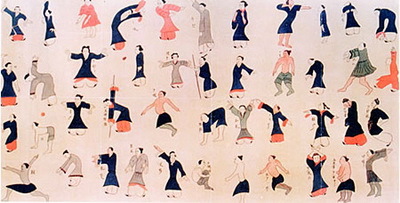 The Dao Yin Tu 導引圖 movements and breathing exercises depicted on the Mawangdui 馬王堆 scroll, dated from around 200 BC, indicate that the concept of slow, flowing movements coordinated with the breathing and circulation of Qi throughout the body pre-dates Zhang and Chen by at least 1,500 years, and predates the arrival of Bodhidharma as well. It is commonly known that monks traveled to study between various Daoist, Confucian, and Buddhist Temples, the most popular of the latter being the Shaolin Temples. An ancient Shaolin kung fu sequence dated to the era shortly after Bodhidharma's time bears striking resemblance to Taijiquan, in its soft, slow, flowing movements, accentuated with quick bursts of fa jing (emitting power). This 1,500 year old Jin Gang Quan 金剛拳 sequence, also known as Vajra Fist, which means "diamond, or thunderbolt" has roots in Buddhism. The Vajra is a short metal weapon which doubles as a symbol representing the indestructible firmness of spirit and spiritual power, and the transcendental nature of reality. In Buddhist ritual, the Vajra symbolizes the male principle in the right hand and the Bell symbolizes the female principle, which is held in the left, and their interaction leads to enlightenment. In Chen-style Taijiquan, a related hand form is frequently used in the movement named "Vajra Pestles" (Jin Gang Dao Dui). So, who created Taijiquan and when? No one can sufficiently answer the question of when exactly Taiji philosophy was merged with the martial arts. The evidence of this event is missing, because it cannot be attributed to a single person or a specific time. It is exactly for this reason that Zhang, San-Feng is considered the founder and patriarch of Taijiquan; because he represents the wisdom of ancient China itself. He was an accomplished, popular Daoist practitioner of the era and he embodied the Internal arts: neigong, tu na, dao yin, yangsheng, and Taiji philosophy - the essence of Taijiquan. Those ancient shamanistic practices are known to be thousands of years old. Recent archaeological findings of yin/yang symbols carved into tortoise shells and stone are estimated to be as much as 5,000 years old, so it seems the fundamental concepts of Taiji yin/yang philosophy, such as the spiraling nature of creative energy, and observing and harmonizing with natural cycles, have existed for millennia. (Readers interested in ancient history may be intrigued that relics from the 5,000 year old Mayan culture in Central America contain a symbol similar to the yin/yang*). These fundamental Taiji concepts were already thousands of years old when Zhang and Chen popularized them, and there were probably hundreds of masters whose names are lost to history who could be considered equally responsible for the transmission of the principles within the Internal arts and the origin of Taijiquan. It is evident that many people contributed to the evolution of Taijiquan over the course of many centuries. As historical evidence is uncovered, it becomes clear that the essential Internal Arts principles, basic 13 patterns, and theory of Taijiquan that are attributed to Chen, and earlier to Zhang, have roots in pre-historical China. By practicing Taijiquan and its related Qigong, we connect ourselves in the present moment to this precious teaching that has been passed down from teacher to student for thousands of years. Practitioners of all styles all equally claim ownership to the art of Taijiquan, and as more evidence is revealed and hopefully translated to English, we will discover a comprehensively detailed history. Rather than quarrel over lineage, we may instead humbly practice and aspire to attain the wisdom that can be found within Taijiquan. David Silver is a writer, editor, and video director for YMAA Publication Center, and the co-writer of Sunrise Tai Chi and Sunset Tai Chi. He studies and teaches Qigong under Dr. Yang, Jwing-Ming and is a perennial Taijiquan beginner.